After months of scandals in sports, politics — and society as a whole — the top buzzword of 2018, announced Monday, struck a strikingly positive tone as the year winds down. 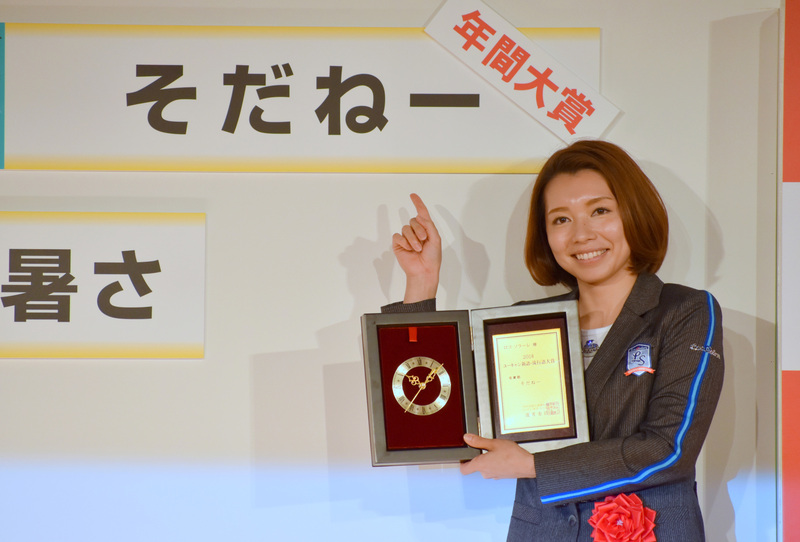 “Sodanē,” essentially a shortened form of sō da ne (that’s right) that was popularized by Japan’s female curling team during the Pyeongchang Olympics and gained them fans on their way to a bronze-medal finish, also took home the award for the year’s top buzzword. After the word won top honors at the 2018 U-Can Shingo Ryukogo Taisho (2018 U-Can New Words and Buzzwords Awards), Japanese linguist Hideho Kindaichi, a member of the selection committee, stressed its organic nature. Kang Sang-jung, committee member and political science professor at the University of Tokyo, said that this year’s buzzwords — presented for the last time in the Heisei Era — evoke feelings of exhilaration — in stark contrast to terms that gained popularity in previous years. “This year, around the world, words have been used for many different purposes,” he said. “I think the world of politics has many people with poisonous tongues who misstate the truth. Fake news as well. “But in the midst of all the satire and criticism, there were many words that allowed us to soften our hearts,” Kang added. Only one term referring to the nation’s politics cracked the top 10 announced by the Jiyukokuminsha publishing house this year: “Gohanronpō” (“rice reasoning”). It was popularized by Hosei University professor Mitsuko Uenishi, who pointed to a political tactic of dodging a question by intentionally misinterpreting it. As an example, Uenishi referred to asking someone whether they had eaten “gohan,” which can refer to rice or a meal itself, and thus can trigger contradictory responses. Labor minister Katsunobu Kato is said to be among the politicians using such tactics. Sodanē and gohanronpō were also winners in a survey conducted by The Japan Times following the candidates’ announcement in November. The top 10 most popular words or phrases were chosen from a short list of 30 based on readers’ answers to a questionnaire included with an annually published book explaining news events. Other buzzwords rounding out the top 10 included “saigaikyū no atsusa” (disastrous heat), based on the record-breaking temperatures that killed 65 people in just a week, part of a string of natural disasters that included torrential rains and flooding. 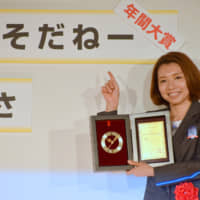 Shigeki Sakakibara, a spokesman for the Meteorological Agency, said in accepting an award recognizing the popularity of the word that the agency was hoping the popularity of the term will help raise awareness of natural disasters and ensuing risks. The committee also highlighted #MeToo, the U.S.-born movement against sexual abuse that Japan has been criticized for being slow to embrace. It gained momentum after female journalist Shiori Ito went public with allegations of having been raped by a high-profile journalist with ties to Prime Minister Shinzo Abe. A controversial statement by Finance Minister Taro Aso, downplaying an incident of alleged sexual harassment at his ministry, only fueled protests against sexual abuse. The committee gave that award to all people who have spoken up against such misconduct.